Scented Leaf: Go FICUS, Go! 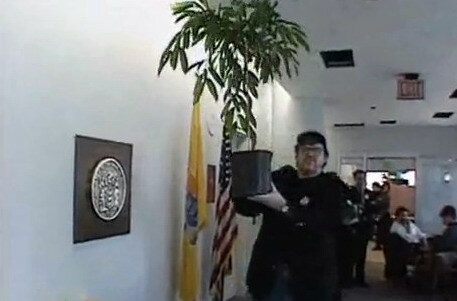 What do you think, a Ficus tree can do a better job than some of the people who actually get elected? Well ... apparently... one American Ficus Neriifolia plant, 25 years old, US citizen, resident of New Jersey... has ran for Congress in 2000. Michael Moore, a very ingenuous satirist and filmmaker, made an awesome documentary - part of "The Awful Truth (TV Series)" - , "Ficus for Congress", when enlisted his Ficus Plant to run as candidate in "24 American Congressional Race" in the state of New Jersey. Later, Ficus plants were enlisted also in Alabama, Arkansas, California, Illinois, New York, North Carolina, Ohio, Pennsylvania, South Carolina, Texas, Virginia and Wyoming. Indeed, was an interesting modality to allow the voters to indicate disapproval of all of the candidates (None of the Above / NOTA or against all listed as a ballot choice during elections) and was a nice fight for Change. I know some people don't like Michael Moore, but I always love seeing what he'll come up with next! That Ficus looks like a pretty good candidate to me! Well, it wouldn't change its position after getting in power.